When it comes to setting up an aquarium, the most obvious choice is between a fresh water or a more complex marine set-up, but there is also a third option -a brackish aquarium. Brackish water occurs where sea water and fresh water meet, close to the mouths of rivers and in mangrove swamps. To achieve the right level of salinity, you can use a blend of marine salts available from aquatic stores. Take care to keep the nitrate levels low in this type of aquarium, because brackish water fish are more vulnerable to a build-up of this chemical than most freshwater species. Some of the most unusual and interesting aquarium fish have adapted to survive in these conditions, where the salinity may vary widely. Brackish water is suitable for mollies, although they are usually kept in freshwater tanks, which unfortunately makes them more vulnerable to fungal disease and white spot. Another livebearer that thrives in a brackish tank is the striped four-eyed fish (Anableps anableps). 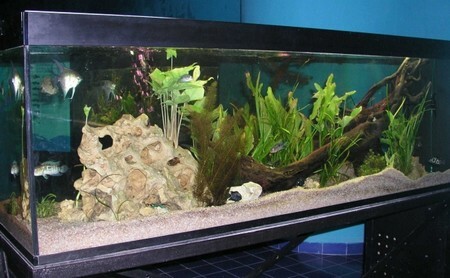 Make sure there are no jutting rocks or sharp objects in the „ aquarium that could damage their vulnerable eyes. The male’s gonopodium is directed to one side of the body and he needs to find a female with a compatible genital opening if mating is to succeed. Females have up to four offspring, which are typically 2.5cm (1in) long. While four-eyed fish are insectivorous, they do not have the hunting capabilities of another brackish water species – the archer fish (Toxotes jaculator), which is silver with striking, triangular black markings across its back. It earns its name because of its impressive ability to shoot down insects into the water from overhanging vegetation, spurting droplets of water at them from a short distance away. Another unusual fish that thrives in brackish water is the Indian glassfish (Chanda ranga). Unfortunately, their naturally transparent, glass-like appearance has sometimes been artificially coloured by the unpleasant and cruel practice of injecting them with dyes which show through their bodies. Although most reputable shops refuse to stock dyed glassfish, you may still occasionally see them, but you should never buy any fish in this condition. 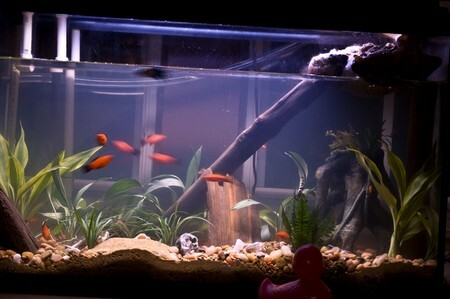 The corrosive effects of salt water mean that you must use an all-glass aquarium rather than an old metal-framed tank, and choose a plastic rather than a metal hood. Covering the aquarium is important, not just to provide housing for the lighting but also to prevent the water from evaporating, which may occur at a fast rate in centrally heated homes. If too much water evaporates, this in turn causes the salt content of the remaining volume of water to increase rapidly. Certain species of brackish water fish naturally have very variable coloration, such as scats (Scatophagus argus). These fish may range in colour from silver to gold or shades of red, while their contrasting darker markings can vary from spots to stripes. If you are keeping scats, you can provide them with good companions in the form of monos. A shoaling fish by nature, the mono (Monodactylus argenteus) has a flattened, silvery body, with yellowish fins, which tend to fade with age. Black stripes run through the eyes and also across its gill covers. Pufferfish (Tetraodon fluviatilis) also thrive in a brackish aquarium, although they may be aggressive and are best kept on their own. While some species inhabit brackish waters, others are adapted to a marine habitat, so check on the exact water conditions needed in advance. Their jaws tend to become overgrown if they do not have enough hard-shelled food, such as river shrimp, and they become unable to eat. In this case, the jaws have to be trimmed under anaesthetic by a vet. More peaceful by nature is the bumblebee goby (Brachygobius xanthozona), which has black and yellow markings and grows to only about 3.5cm long. It may be shy, so it appreciates somewhere to hide. Most aquatic plants will not grow in salty water, but there are a few that can prove sufficiently adaptable to tolerate a brackish environment. These include the Java fern (Microsorium pteropus), which will root on submerged objects such as rocks. Vallisnerias can also prove sufficiently robust to survive in brackish surroundings but these particular plants will rarely grow as well here as they would in fresh water. The other option is to use plastic plants instead. It is quite easy to make up the water for a brackish aquarium, using a suitable marine salts blend from aquarist shops. Treat the water with a dechlorinator before adding the marine salt. This is because dechlorinating chemicals are often less effective in salt water, which could have fatal consequences for the fish. Follow the instructions on the packet for mixing the salt, stirring the recommended quantity of the salt into ordinary tap water, and make sure that it has dissolved completely. Do this in a bucket before you add it to the tank. You can measure the salt content of the water quite simply using a hydrometer, available from aquatic stores, which will give you a specific gravity (SG) reading. The water for a brackish tank should have a specific gravity figure of between 1.005 and 1.015. Regular monitoring is vital because as the water evaporates, the remaining water will have a higher concentration.